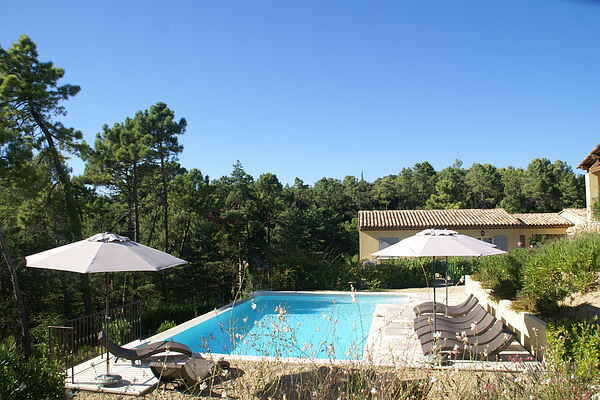 You will stay in a luxury apartment for four people in a small residential complex in the heart of Provence, a half hour drive from the Cote d 'Azur The residence is located in the forest,. Enjoys the smell of eucalyptus, lavender, rosemary and the chirping of the cigalles (crickets). Cool off in the beautiful pool. For the more energetic there is a table tennis table and a jeu de boules (balls provided). In the apartment you have a covered terrace and private tuinOp 1 km away is the lovely village of Montauroux. Take a seat on one of the benches on the square and enjoy the view of Lake St. Cassien. Also Spend a day in Cannes (25 km) to z 'n French to strolling along the famous Croisette on one side, tall palms and other beautiful white sand beaches. Or grab in the harbor of Saint Raphael the boat to sail to Saint-Tropez on the Méditerrannée. Further inland you will discover the genuine charm of Provence: lavender fields and villages with houses with the typical Roman tiles.